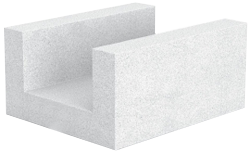 U blocks are ACC elements used as stay-in-place formwork when making reinforced concrete beams, lintels, lowered tie beams or reinforced concrete columns. 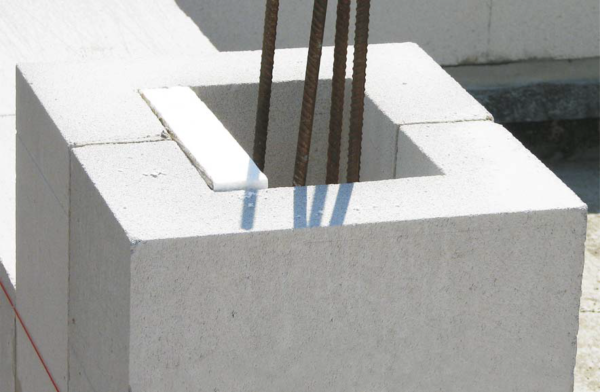 Reinforced concrete elements are made in U blocks after reinforcement, laying the thermal insulation (if required – e.g. in a single-layer wall) and filling with concrete. U blocks are a great help in making these elements. As long as the concrete bonds, they require mounting support. Diversified width of elements allows to adjust them to the width of the blocks used in the construction of walls. Tolerance for lenght and width dimensions: ± 1.5 mm, height: ± 1.0 mm. Autoclaved aereted concrete is available on non-returnable pallets 120 x 100 cm.